Valproate products include valproate sodium (Depacon), divalproex sodium (Depakote, Depakote CP, and Depakote ER), valproic acid (Depakene and Stavzor), and generic versions of these products. The Food and Drug Administration and Abbott Laboratories have strengthened the contraindications, warnings and precautions sections of the label for divalproex sodium, valproic acid, and valproate sodium, marketed as Depakote tablets, Depakote ER tablets, Depakote sprinkle capsules, Depakene capsules and syrup, and Depacon for injection. 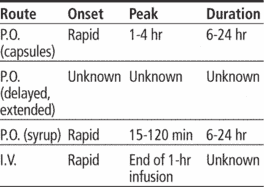 Drugs that can be given intravenously, such as diazepam, phenytoin and valproate sodium solution, typically have the most rapid onset but are limited to use in clinical settings by health care professionals authorized to use them. Andrx Corporation ("Andrx") (Nasdaq:ADRX) today announced that the United States Food and Drug Administration ("FDA") issued a tentative approval for Andrx's New Drug Application ("NDA") Section 505 (b)(2) of the Federal Food Drug and Cosmetic Act for valproate sodium delayed-release tablets 125mg, 250mg and 500mg. plus generics), valproate sodium (Depacon, Abbott; plus generics), and valproic acid (Depakene, Abbott; plus generics) are other common drug-related causes. The high risk of neural tube defects and other major malformations in babies exposed during the first trimester to valproate sodium and the related products, valproic acid and divalproex sodium, is the focus of an FDA notice. The Food and Drug Administration and Abbott Laboratories have strengthened the contraindications, warnings, and precautions sections of the label for divalproex sodium, valproic acid, and valproate sodium, marketed as Depakote tablets, Depakote ER tablets, Depakote sprinkle capsules, Depakene capsules and syrup, and Depacon for injection.